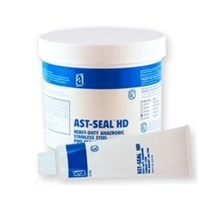 AST-SEAL™HD (Heavy Duty) stainless steel grade is formulated for stainless steel alloy fittings to cure more quickly than standard grade anaerobic. Withstands temperatures from -65° to 400°F (-54° to 204°C) continuous, 500°F (260°C) intermittent. UL Classified. Not for oxygen use. Pressure Range: Seals to 1,000 psi immediately after application and up to the burst rating of a typical pipe after curing. Will not clog small openings typically found in hydraulic systems. Applications: Most metal threads, particularly steel and brass, ideal for fittings, pipes, valves, gauges, and connections in hydraulic, pneumatic, lubrication, steam, and refrigerant systems. Inert to most industrial hazards and hydrocarbons (gasoline, diesel fuel, ethanol, etc. ), most acids, chemicals, solvents, and gases. Please call 1-800-991-1106 for 14L Pail price. Click here to see our video on how to apply this product.